You’re on Easter Quotes – page 1 of 4. Our collection of quotations and sayings provide you some ideas on material to include in cards, notes, and emails. Easter is the most holiest of days in most Christian religions as it’s a celebration of Jesus resurrection from the dead. It is preceded by Lent, a 40 day preparation time period where many followers fast and give alms in preparation. The week leading up to Easter is referred to as Holy Week, with Good Friday, Holy Saturday and then, Easter Sunday. Easter does not fall on one set day, rather, it’s a movable feast. Traditional traditions include the Easter Bunny, Easter basket and eggs, and parades. ‘Twas Easter-Sunday. The full-blossomed trees filled all the air with fragrance and with joy. Whatever you are doing, that which makes you feel the most alive…that is where God is. Imagine Jesus crucified in your arms and on your chest, and say a hundred times as you kiss His chest, “This is my hope, the living source of my happiness; this is the heart of my soul; nothing will ever separate me from His love. It’s not about the bunny – it’s about the Lamb. To live Easter means to enter into the mystery of Jesus who died and rose for us. Have a Happy Easter for Peeps Sake! If you see a rabbit laying little brown eggs, don’t eat ‘em. It’s not chocolate. Silly rabbit, Easter is for Jesus. 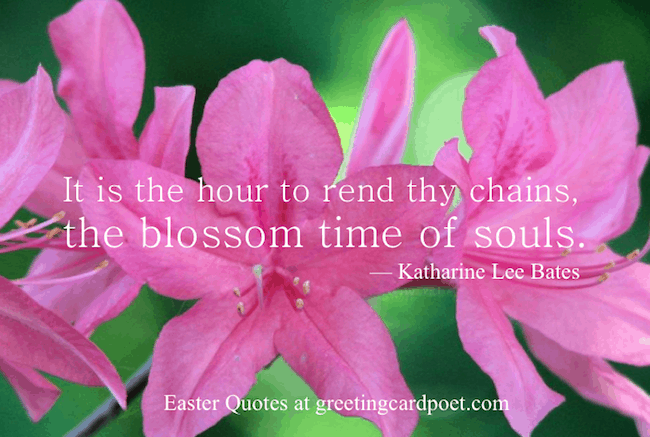 If you have other suggestions for Easter quotes to include, please let us know via the Contact page. Thanks!